← Should a university accommodate a man’s religious objection to interacting with women in class? If you’re coming here for the nature stuff or the poetry, well, I’ll get back to that next week. I wanted to keep on the religion/secularism thing for one more post and throw up a couple links about religion and material culture – punningly literal material culture. I’m talking about clothes, son. I’m teaching a class on doing research in religion and secularism studies this semester, so it’s even more on my mind than usual. First, this blog post by the Pew Research Center about a University of Michigan study about religion and secularism in primarily Middle-Eastern Muslim-majority countries drew a lot of attention, as it focused on social attitudes toward appropriate women’s dress as an index of secularism, Westernization, and Muslim identity. In particular, the infographic at the top of the post went massively viral. 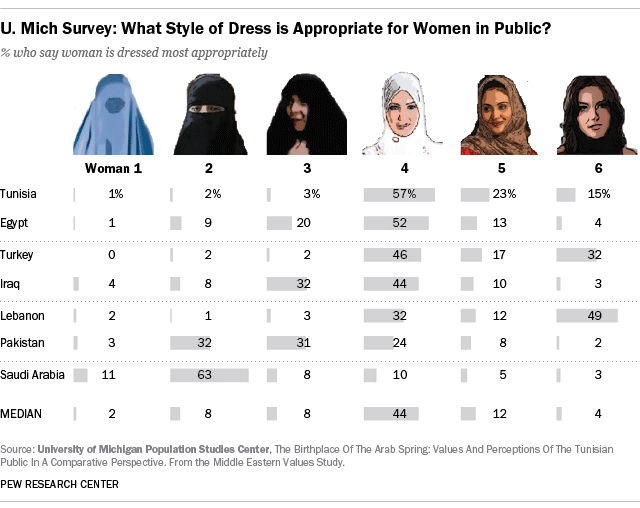 It shows stylized portraits of six Muslim women from the head up in attire perceived as increasingly less restrictive, starting with the burqa and then moving toward an ultimately uncovered head and Western attire, and then gives the percentage of respondents from each country that selected that attire as the most appropriate dress for women in public. Some of the attention the graphic drew was satirical, some of it disapproving, but mostly it would seem the attention was due to the fascination with how Muslim women dress. (Hey, I retweeted it too.) Hence the disapproval, that Pew was playing into the Western obsession with Muslim women’s hair-covering, not to mention that the graphic abstracted women in the countries covered to a handful of caricatures. I get the discomfort with the reduction of women’s presence to a sliding scale of clothing marked as increasingly foreign and weird, and I get the annoyance at how fascinated people seem to be with this aspect of culture in Islamic societies. But 1) I think a graphic like this helps give people a slightly better picture of the complexity of cultural expressions of and responses to female modesty in the Islamic world, and, 2) as the authors of the study point out, issues of women’s dress have been central to internal debates about the status of women and secularization for over a century. I think, too, though, that the study could have used some more sophisticated thinking about dress and religious identity that would have helped them move beyond the rather simple and Eurocentric contention that the question of dress unproblematically “also revolves around the question of individual choice, gender equality and a woman’s control over her own body and sexuality,” but it’s certainly true that those questions come up. The benefit of a more nuanced approach can I think be seen in the interesting and unsurprising gender breakdown of responses in regards to dress. Men and women in each country were largely in agreement about appropriate attire, but differed considerably “on the issue of a woman’s right to dress as she wishes. Women are more strongly in favor of this statement than men across the seven countries. People with a university education are also more supportive of women’s choice (except in Saudi Arabia).” That the Christian populations favor less restrictive clothing is also not surprising, and of course reflects economic and cultural situations and not exclusively religious. What does it mean, I would want the study to explore, that women can insist on having more control and more choice over their clothing, positions that could certainly be seen as reflecting secular values, but that their choices would still mesh with those seen as being more religious, or more traditional?